There are many, many times when I just don’t feel like cooking, no matter how hungry I am, or how fabulous the recipe is. And now with a new baby and toddler taking up all time and energy, these times are much more frequent. Therefore, it’s super important for me to have some go to meals that I can get on the table fast, that are Weight Watchers friendly, and that taste good! 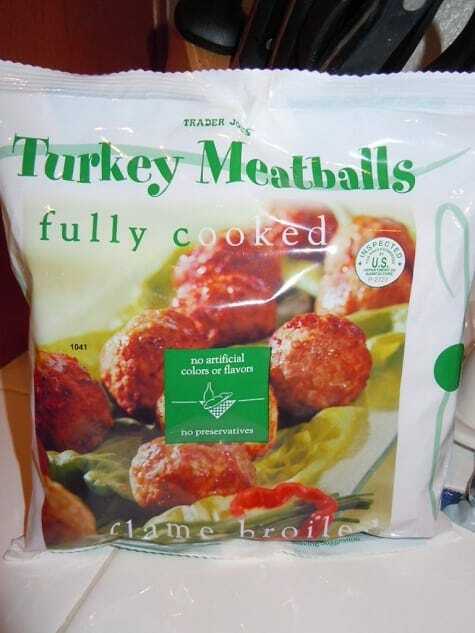 One of my favorite quick and easy meals are these low calorie Turkey Meatballs from Trader Joe’s. They’ve been around for a while, but a lot of people don’t know about them, or have never tried them before, so I felt they were blog worthy. Plus, each 2 meatball serving is just 3 Points, and these are some pretty decent sized meatballs. They come frozen, fully cooked. I just toss them into a large saucepan with a jar of my favorite low calorie marinara sauce, and heat up. Voila! Delicious, low Points dinner! You can top your pasta with these meatballs, serve them on a low calorie roll and top with light cheese for a great meatball sub, or just eat them straight up. With no artificial colors or flavors and no preservatives, these tasty turkey meatballs are not only diet friendly, they are pretty healthy too. I love that they are so easy to prepare because essentially, all you have to do is reheat them! They are juicy and full of flavor too. Trader Joe’s…you’ve done it again. If you are a Weight Watcher looking for a quick healthy meal idea to try, pick these up ASAP! I love turkey meat, but these “meatballs” were disgusting, and spoiled a whole pot of sauce with their funky hotdog-like strangeness. Disgusting. I threw away the other half of the package I’d not yet used. My boys LOVE these, just the other day one asked me if I thought Trader Joe’s might give me the recipe for them! When I’m really in a hurry I pop them in the microwave w/ a little vegetable broth and they are simply delicious.